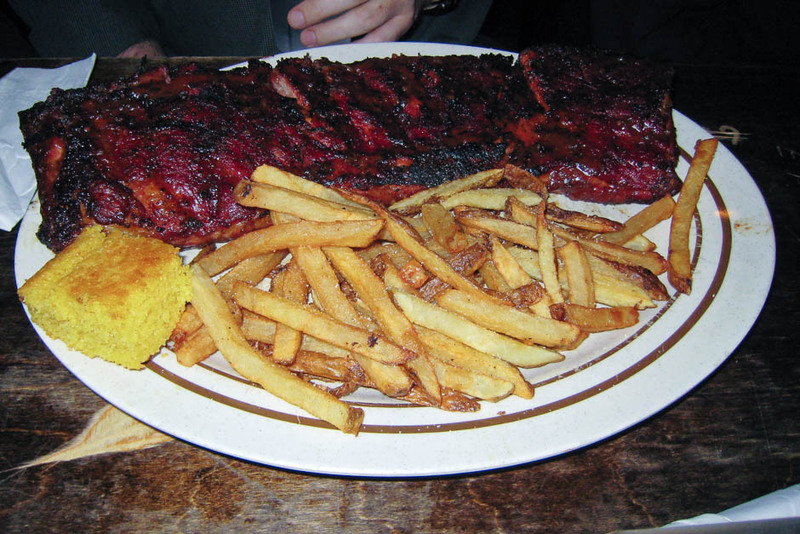 Tonight, some co-workers and I ventured to the way-upper-west-side and had dinner at Dinosaur Bar-B-Que. We started off with some very good spicy chicken wings. I’m not sure where they get their chicken from, but they were some of the largest, meatiest chicken wings I’ve ever had. I’m thinking whoever raises their chickens is working with Barry Bonds’ “trainer”. I got a half-rack of baby back ribs (with mac-n-cheese and fries on the side), and they were quite good. They make them with dry-rub and were nice and tender, but not too tender. They pulled away from the bone easily, but didn’t fall off without some help. They had a nice variety of barbecue sauces on the table and the mac-n-cheese was very well made…nice and crusty with some sort of spice on top (maybe cayenne?). The atmosphere is exactly what I want in a ribs place. Lots of unfinished wood, hubcaps and old posters/advertisements on the wall, The Rolling Stones playing on the stereo, and wooden tables with hand-carved names in them. The place was fairly crowded for a Wednesday night at 7 p.m., but it wasn’t crazy, and the service was pretty good. There is one minor downside to it…it’s located at 131st Street and Riverside. It’s not ridiculously out of the way, but there are places that are just as good that are a lot more convenient for people that live in mid-town Manhattan or the outer boroughs. I left stuffed. And isn’t that exactly what you want from a barbecue joint?